The park could be perfect for your next fishing holiday. The Cairngorms National Park is not only the United Kingdom's biggest National Park it is undoubtedly one of our most spectacular. The quiet village of Laggan is right in the middle of the Cairngorms National Park and is flanked by both the Monadhliath and Grampian mountains so it's no surprise that there are plenty of opportunities to get close to nature in this stunning part of the country. Red deer, red squirrels, golden eagles and rare Osprey all call Laggan home. For those that like to get their adrenaline pumping there's the Laggan Wolftrax bike trails close by and for those that like to take it a bit easier there's walking, fishing, bird-watching, golf, horse and pony riding and cycling. The Cairngorms National Park is not only the United Kingdom's biggest National Park it is undoubtedly one of our most spectacular. The quiet village of Laggan is right in the middle of the Cairngorms National Park and is flanked by both the Monadhliath and Grampian mountains so it's no surprise that there are plenty of opportunities to get close to nature in this stunning part of the country. Red deer, red squirrels, golden eagles and rare Osprey all call Laggan home. For those that like to get their adrenaline pumping there's the Laggan Wolftrax bike trails close by and for those that like to take it a bit easier there's walking, fishing, bird-watching, golf, horse and pony riding and cycling. The Laggan Drey offers the following facilities. Underfloor central heating throughout with additional heating from log burning stove in sitting room. Bottle gas cooker, microwave, fridge, freezer, washing machine, tumble dryer, dishwasher, colour TV, video, DVD player, stereo/CD player etc. Fuel, power and starter pack of fuel for the log burning stove inc. in rent. Bed linen and towels inc. in rent. Cot and highchair available on request. Off road parking for 2 cars. Raised open decked area and open grounds. One well behaved dog welcome at a £15 charge. Sorry, no smoking. Shop 5 mins walk, pub 20 mins walk. Note: 8th - 22nd October 2011 is charged at F rate. An unusual detached timber cottage on the outskirts of the village of Laggan, featured in the TV series ‘Monarch of the Glen’, in the Cairngorms National Park. 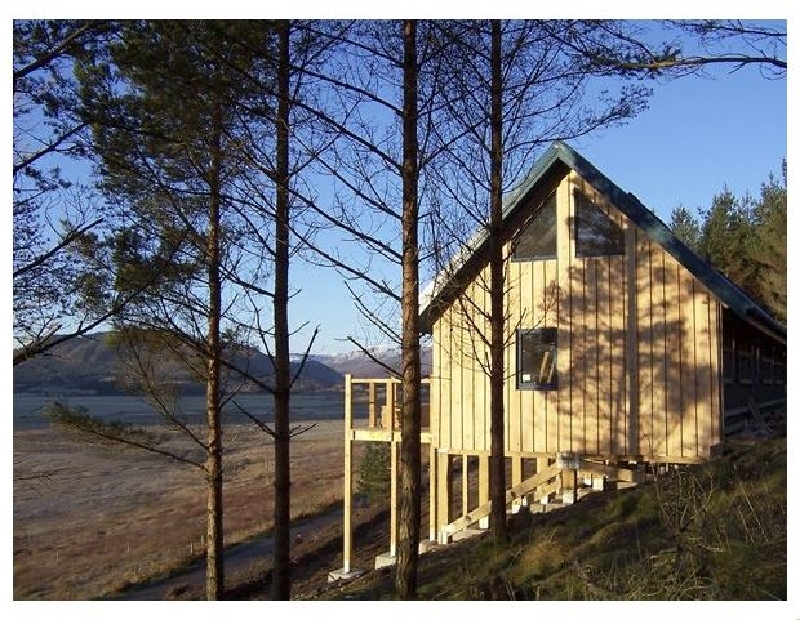 Built on stilts, the cottage enjoys dramatic views towards Ben Alder and Craig Meagaidh and is full of character. The property boasts a high cathedral ceiling in the open plan living accommodation, a log burning stove and en-suite facilities. The Laggan Drey offers well equipped and comfortable accommodation, perfect for families and groups wishing to take advantage of the plethora of outdoor pursuits that this wonderful part of the Scottish Highlands has to offer. The property is less than a mile from Laggan Wolftrax, one of the most highly rated mountain bike centres in Britain. Newtonmore is just 8 miles away with a variety of shops and pubs, along with a craft centre and two excellent museums. An ideal holiday location with something for all the family! All ground floor. Three bedrooms: 2 x twin, 1 x double with en suite (shower, basin and WC). Bathroom with bath with shower over, basin and WC. Open plan living accommodation with modern fitted kitchen, dining area and sitting area with log burning stove and patio doors to raised open decked area. Have you been to The Laggan Drey? Please submit your review so that others can benefit from your experience. Important note: Information provided here about The Laggan Drey is based on our best knowledge. However, please check with The Laggan Drey before booking to ensure that you have the information required. Reviews are the sole views of the contributor and do not necessarily represent the views of CampsitesandCaravanParks.com or The Laggan Drey.